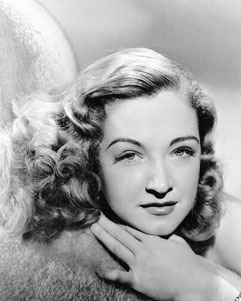 Nina Foch (her last name pronounced "Fosh") was born in Holland to a Dutch father and American mother. The family moved to New York City, and as a toddler she was the subject of a child custody battle in her parents' high-profile divorce. She attended the American Acadamy of Dramatic Arts and also studied acting under Lee Strasberg and Stella Adler. The 1940s saw her in a string of B movies, and in 1947 she appeared on Broadway, given a prominent part in Norman Krasna's farce John Loves Mary. In the early 1950s roles allocated to her improved markedly. She was cast as Milo Roberts in the 1951 MGM musical An American in Paris, which won the Oscar for Best Picture that year, and as Marie Antoinette in Scaramouche the next year. In 1955, Foch was nominated for an Academy Award in Executive Suite. Other highlights from her lengthy resumé include the role of Bithiah, who raised the baby Moses in The Ten Commandments (1956), and patrician Helena in Spartacus (1960). For decades, Foch taught classes at the USC School of Cinematic Arts. She died in 2008 from myelodysplasia complications, at UCLA Medical Center.